Etherlords 2 Game Review - Download and Play Free Version! Be the Hero of a Magical Race in This Unique RPG Combat Game! Enter the World of Lords where Ether constitutes the flow of life itself. Join one of four races: the Kinets, Chaots, Synthets and Vitals, each of which follows a particular form of Ether current. Build up your hero as you fight for control of the land and gain dominance for your faction. Experience even more of the collectible card gaming and turn-based strategic fun of the Etherlords series. 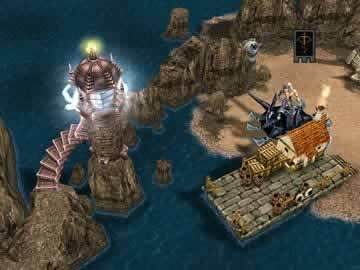 Etherlords 2 keeps many of the main gameplay elements of its predecessor while improving the game's combat. Instead of controlling multiple heroes spread across a large map you now control only one hero from a fixed camera angle. This gives an experience similar to Diablo as you walk around the map and search for missions and treasure. The combat system is where the game really shines. It consists of turn-based combat involving collectible card game elements. You build up a deck of spells and creatures to suit a particular strategy and use them to fight enemy heroes and monsters. In combat you spend Ether to cast spells or summon creatures during your turn. With the end of each round your Ether channel increases and you can spend more Ether in each successive round, allowing you to summon more powerful creatures. What makes this title really stand out is the vivid 3D animations of your creatures running, attacking and bleeding on the battlefield. The sheer quantity of direct combat spells, support spells and summoning spells opens up multiple avenues for player strategies. You can summon several weak creatures and hope to take out your opponent quickly or use your spells to make a few creatures extremely strong. One of the best features of the combat system is that fights won't last forever because of Ether Disturbance, which means that if a match drags on, both heroes will start sustaining damage every round. Therefore, one strategy is to play defensively, raise your health and let the Ether Disturbance slay your foe. Etherlords 2 provides hours of fun and exciting gameplay that conforms to your own gaming style. Develop your own strategy and deck to complete the five campaigns or participate in single-player duels. Additionally, you can enjoy internet or LAN play with up to eight players! If you are a fan of the original game or just relish a compelling role-playing experience, download Etherlords 2 and start your quest today! Etherlords 2 is a turn-based strategy game that has combat very similar to Magic: the Gathering and provides some rather addicting gameplay. The main exploration map has rather good 3-d graphics comparable to those found in Warcraft 3, but it is in the actual battle screen where things really heat up. The combat in Etherlords 2 has your character pitted against your enemy but the twist is that you cannot directly attack each other, unless you have the right spells. Instead most of the turn-based battles are between the creatures you summon, such as lumbering treants, mech worms, giant wasps, and many others. The variety of spells you can buy, find on fallen enemies, or receive for completing side quests is quite astounding and helps to keep things fresh. With each round of combat you receive greater amounts of ether, which you spend to cast spells, and this adds to the strategic element since you'll have to wait to caste your really powerful spells until later on in the match. An additional element, which is quite nice, is the ether disturbance which causes both characters to take progressively greater amounts of damage each round as the match reaches later rounds. This added feature is very beneficial since it keeps matches from dragging on and opens another route for gameplay since you can try to just boost your health and wear your opponent down until the disturbance kills him. With four campaigns and races to master there are hours of enjoyable gameplay to be found. With each campaign you'll follow through with only on hero, which makes gameplay very addictive since it really feels like you are building up a truly epic hero and there is more of an impetus to search out those side-missions since they will make your character stronger or add in special talents. The only slight annoyance to the game is that you must manually go into your inventory and swap spells around into your active deck, but this is only a minor issue. Overall, Etherlords 2 is a great game for fans of collectible card type games or just for someone looking for some great strategic turn-based action. At the very least try out the demo and play through a couple levels of a campaign to see if this the type of game for you. Watch one of the many battles you will take part in with Etherlords 2.